If you’ve been around for the last two years or so, you may be familiar with our partnership at Walnut Grove Secondary School during summer time called GatorShades. GatorShades is a transitional program for students in grade 7 that are going into grade 8. It runs for 3 weeks in July, all day, Mon-Fri. It is aimed at the students who are most likely to get lost in the transition of coming into a big high school. The students are set up to learn some practical pieces, like learning your way around the school, how to use your locker, and how to read your timetable. These are intermixed with fun activities (which we are largely in charge of) intended to build relationships between the students and us, and challenge them with new experiences. In the past we have taken them to try a ropes course, salmon farming, riding our segways, or a local petting farm. My first GatorShades experience was last year, and now that I’m on the other side of that year I can’t begin to explain how valuable this program is for us as youth workers. We are able to build solid depth of relationships in the space of three weeks. We are often able to build trust and memories, all before grade 8 even starts. 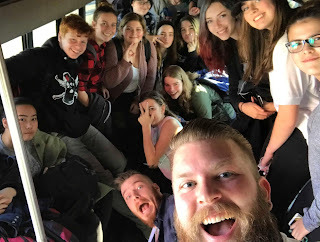 Coming into WGSS in the fall, we end up being one of the few familiar faces they know and trust and are able to continue pouring into them for the rest of their high school experience and beyond.